One Piece is perhaps the most well-regarded of the “Big Three,” the three most popular and longest-running Shōnen Jump weekly manga. These three are known largely for their impressive length. At the time of this writing, Naruto has recently ended with 700 chapters, Bleach is in the mid-600’s, and One Piece has just passed the 800-chapter mark. I can’t speak to the quality of Bleach or Naruto, because only One Piece has ever really interested me. Why? Well, upon reflection, I’ve realized that there’s one key reason that One Piece initially drew me in and has continued to hold my attention: no matter how drawn-out and long-winded the plot can get, I never feel like it’s wasting my time because the story is structured in such a way that it always feels like it’s going somewhere. Just a few quick notes here: I’m very unfamiliar with Naruto and Bleach. I’ve only ever seen a few episodes of Bleach, and while I’ve read a bit more of Naruto, watched some of Naruto: the Abridged Series, and have a vague understanding of the characters and parts of the plot, I don’t know enough of the story to compare them to One Piece. Instead, I’ll mostly be using Fairy Tail, another similar shōnen series, when I need to highlight where One Piece could go wrong but doesn’t. In terms of spoilers, I’ll be talking fairly heavily about everything before the Straw Hats reach the New World and making a few brief allusions to what comes next. Also, what I’m talking about is specific to the manga. Most of what I’m going to say makes no sense if we include the pointless filler, and I don’t imagine I’d be doing much praising of One Piece had I watched the anime through the horrible 1-episode-per-chapter pacing instead of switching to the manga. With those notes out of the way, let’s get right down to business. So how is One Piece, such a long-running story, able to feel like it’s constantly moving? The answer lies in its structure. That’s what writers need to be breaking down, analyzing, and learning from. The first thing that One Piece does is that it establishes an endpoint way at the beginning. Luffy is going to become King of the Pirates, and he’s going to accomplish that goal by finding One Piece. Right off the bat, the series is given an ending point. Luffy has a goal he’s working towards, and a very specific way of accomplishing that goal. Most everything that happens in the story takes the Straw Hat Pirates a step closer to accomplishing that goal. Compare that to other series. Naruto has some dream of becoming Hokage, and that does happen in the end, but that’s not what the series ultimately ends up being about. Fairy Tail’s main story arc seems to be related to Zeref, but he’s not even mentioned until chapter 12 and then only receives vague, ominous allusions until the story is already well over 100 chapters in. You know what One Piece is about from the very beginning. After that, the biggest part of the secret is how One Piece is laid out. There are three layers of storytelling going on at any given time in One Piece. On the broadest layer are what I’ll refer to as the Grand Arcs (the other two layers have official names, but I’ve made this one up). Grand Arcs are the story of what’s happening in and to the world. They run throughout the entire story, and their presence is occasionally felt, but they very rarely become the main focus. 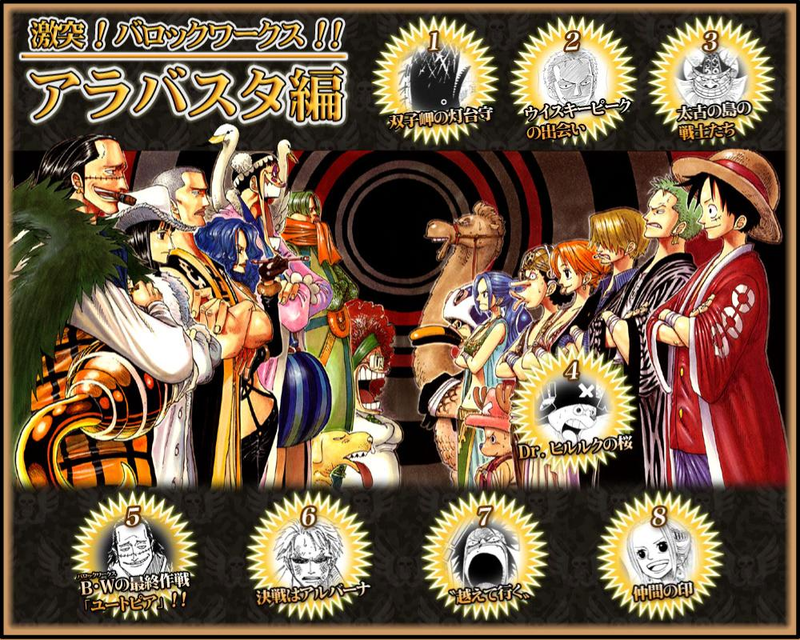 These are the storylines of what’s happening with the Four Emperors, the World Government, the Seven Warlords, Blackbeard, and others, as well as mysterious elements that will greatly affect the course of the plot, such as the 100-Year Void or the Will of D. And of course, there’s Luffy’s quest to find One Piece, as well as the personal dreams of all the Straw Hats. They will have long-term payoffs, and the payoffs will likely be very large ones, but they’re ones that will come near the end of the journey. These Grand Arcs are ultimately why I’m still so invested in One Piece, and likely why most readers are as well. They’re what make the world itself interesting, and they show up or are alluded to just often enough that readers can get the sense of how relevant they’ll eventually become. Of course, long-term payoffs mean nothing if a series consists of nothing but setups for them. This is my biggest gripe with the Attack on Titan manga: that it’s all buildup and no payoff. When the reader is only given quick teasers about important things now and then, the story becomes meandering and frustrating. One Piece solves this with story arcs. At any given time, there is a story arc going on, focusing on what’s happening to Luffy and the Straw Hats. This is generally a small adventure that’s merely the result of the Straw Hats arriving at their next destination and accidentally get roped into some conflict or another that they have to resolve before they move on. These arcs provide short-term payoffs. They’re quicker stories that have resolutions with less impact, but are interesting enough to drive the reader through to the end of it. It gives them a reason to care in the moment, rather than constantly looking forward to the future, and makes the story easy to jump into at any point. I can attest to this personally, as my first real experience with One Piece occurred when I got my hands on a few copies of Shōnen Jump and read some of the Whiskey Peak arc. Weird and crazy things were going on, and I didn’t need to know much of what had happened so far or what was going to happen in the future for me to enjoy what was happening in the present. Story arcs are nothing special or unique, though. Not to storytelling in general, not to anime and manga, and certainly not to shōnen series, which are almost always divided up into story arcs. What truly makes One Piece’s narrative structure so well-suited for a long-running series is the use of what it calls “sagas.” Every saga consists of a group of story arcs, all focused on some larger goal. For example, the East Blue Saga focuses on Luffy gathering his crew, the Alabasta Saga focuses on the Straw Hats taking down Baroque Works, and the Summit War Saga focuses on a series of events that heavily impact the entire world. Sagas are longer and more complex than the story arcs within them, and they bridge what’s happening with Luffy and the Straw Hats to what’s happening in the world at large. Sagas have higher stakes than the arcs and generally result in some progress being made on one or more Grand Arcs. They have big payoffs and bring a sense of closure to part of the story, often checking in with how what has happened in the saga can be felt around the world. -Luffy’s relationship with Shanks and how he becomes a pirate to follow in Shanks’s footsteps. In addition, the method Shanks uses to scare off the Sea King attacking Luffy is a subtle setup for the introduction of Haki much later in the series. The next part of the arc introduces several characters who reappear later, but largely serves to establish the marines, show Zoro joining Luffy’s crew, and reveal Zoro’s dream. Apart from Zoro joining the Straw Hats and the introduction of Alvida, all these things are meant to tie into Grand Arcs. The next arc, Orange Town, continues to set things up. It introduces Buggy, who ends up becoming a fairly important recurring character due to his connections to Shanks and the Roger Pirates. More importantly, it introduces Nami and sets up a bit of her backstory, as well as showing how the Straw Hats acquire a map of the Grand Line. Syrup Village introduces Usopp and mostly exists to give the Straw Hats their first ship, the Going Merry. Baratie is when the East Blue saga really starts building. Sanji is added to the crew as the cook, which fully rounds out the initial lineup of the Straw Hats crew. Nami double-crosses the crew, setting up the next arc. But, most importantly in terms of Grand Arcs, we’re introduced to Dracule Mihawk, the best swordsman in the world and a member of the Seven Warlords of the Sea. Mihawk makes his entrance by slicing a galleon in half and completely trashing Zoro in a duel. After a series of difficult but beatable enemies, Mihawk establishes threats that the crew will ultimately have to face in the future–and, considering Mihawk is the strongest swordsman in the world, Zoro will have to confront him at some point to fully realize his dream. Arlong Park is the arc that seems most like the climax of the East Blue Saga. In this arc, Nami’s character is fully explored and we begin to see how exactly the Straw Hats work together as a team as they face Arlong. This arc also sets up some things that tie into Grand Arcs, such as the idea of Fishmen, several recurring characters, and a mention of Jinbe (who shows up much later in the series), as well as earning Luffy his first bounty and cementing everybody’s place in the crew. After that, we have the final arc of the East Blue Saga, Loguetown. This arc isn’t a big, flashy one like Arlong Park was, instead focusing on the Straw Hats’ final stop before entering the Grand Line and introducing a few characters and ideas. It’s important, but it’s largely setup for later events. We meet Smoker and Tashigi, who become two of the most prominent characters in the Navy, as well as seeing Buggy and Alvida again, letting the readers know we can expect old characters to show up even after they’ve been defeated. It also introduces Seastone as a method of capturing pirates with Devil Fruit powers, draws parallels between Luffy and Gold Roger, and introduces Monkey D. Dragon, Luffy’s father, as a character. The arc, and consequently the saga, ends with the characters once more reaffirming their dreams and goals as they set off for the Grand Line. Each story arc is largely self-contained and can be enjoyed individually, but taken together, they tell the larger story of Luffy gathering his crew and going from a complete unknown to a pirate who’s caught the eye of the World Government. In addition, it slowly begins incorporating worldbuilding that isn’t immediately vital but will later pay off when the Straw Hats are strong enough. In fact, some of the things set up still haven’t fully paid off, like Mihawk as an obstacle to Zoro achieving his dream or Dragon and the Revolutionary Army’s ultimate role in the plot. I personally think this saga structure is handled best in the Baroque Works saga, so I’d like to elaborate on that one as well. Vivi is introduced very early on as part of Baroque Works, a criminal organization attempting to take over Alabasta. It’s established that Baroque Works members are paired off into teams of one male and one female (except for Mr. 2). The males are given a number according to the pair’s rank, and the women are named after days, with Mr. 0 and Ms. All-Sunday at the head of the organization, Mr. 1 and Ms. Doublefinger below them, etc. Vivi reveals that she’s actually the princess of Alabasta who’s infiltrated Baroque Works to save her kingdom, and asks the Straw Hats for help. At that point, Baroque Works becomes an enemy, and readers know they’ll have to fight their way through the ranks. The way the saga is structured, you know what you’re in store from the beginning. When Mr. 5 and Ms. Valentine show up, that establishes that it’s probably the top 5 pairs that they’ll be fighting. That immediately sets a time frame, giving you a rough idea of how long the saga will be. Vivi reveals that the leader of Baroque Works, Mr. 0, is actually Crocodile of the Seven Warlords. We also get a brief appearance by Ms. All-Sunday, his partner, who gives them a display of power. The naming of Crocodile as a warlord and the appearance of Ms. All-Sunday automatically give us a taste of just how difficult the final battle is going to be. After all, the previous warlord we encountered, Dracule Mihawk, effortlessly destroyed Zoro in a duel. Setting the endpoint of the saga, as well as providing an estimate for how long it will be immediately gets readers invested in making it to the end of the saga to see how it will turn out. The rest of the saga is just a bit of island-hopping, but despite how disconnected the individual story arcs are from the rest of the saga, Vivi provides the connective glue that holds the entire arc together. She constantly has her kingdom in mind (reminding readers of the final destination in the saga), and her bonding with the Straw Hats becomes a focal point of the saga. In fact, her friendship with the Straw Hats becomes so focal that it’s actually legitimately a surprise when Vivi decides not to join them at the end of the saga. This structure is most apparent in the first two arcs, but the whole series is like this: continually escalating setups, with small payoffs along the way to satisfy viewers. Luffy has defeated or become allies with many of the Seven Warlords, but because those defeats or alliances usually result in the Warlords losing their rank, there’s always tension in seeing who exactly the next warlords will be. In fact, there has never once been a point where the readers know who all seven are while they’re in power, because by the time they’re all revealed, one or more have already been stripped of that rank. One Piece is an adventure series that’s more about the journey than the destination. However, the series is also always looking forward. Readers always know what the next destination is. Maybe they get sidetracked (Fishman Island is established as the Straw Hats’ next destination in chapter 435, but due to various circumstances they don’t actually begin their journey there until chapter 603), but the readers always know what there is to look forward to in the near future. That’s the heart of what propels the story forward. Whenever one arc ends, the reader isn’t left thinking “where is the story going from here?” because they usually know exactly where it’s going. Either it’s building to the climax at the end of a saga, or a saga has just concluded and it’s showing the impact it’s had on the world as a whole and setting up the next one. When I read Fairy Tail, that was the biggest thing that was missing for me. Things would happen and all I could think was “okay, but where is this going?” There was no rhyme or reason, and it became hard to propel myself through the story when I didn’t know what I would be investing my time in. But One Piece? One Piece draws you in. It simultaneously gets you saying “I wonder when they’ll get to this stated destination” and “I wonder where they’ll go next.” It doesn’t just entertain you in the present, it keeps you looking ahead as well. So if you’re writing a long-running and/or serialized story, what are the lessons you can take from the structure of One Piece? Don’t just have a destination in mind. Establish where you’re going to the reader, then work towards it. Make sure the story always feels like it’s building. Even if it’s not, the illusion of progress still feels enough like progress that readers won’t think they’re wasting their time. Keep arcs relatively short and accessible so that new readers can jump in. Then promise longer-term payoffs that will keep them invested. Make sure you have an idea of what you’re writing in the present, the near future, and the far future, and foreshadow properly. Keep the worldbuilding simple at first. There’s time to delve into complexities later. It’s okay to hold off on the big payoffs, but check in on them occasionally. That was a fascinating read! I made the poor choice at age 12 to follow Bleach instead of One Piece, and this article establishes very well what went so horribly wrong. Thanks for writing this very interesting breakdown.